The 10 Coolest Coffee Shops in Illinois! Local and cozy coffee shops offer a perfect space to unwind and warm up with a hot cup of Joe. You can find plenty of prime coffee shops in Illinois, but only a few stand out from the rest. The following coffee shops feature the best brews and atmospheres, making them the coolest shops in Illinois. For all the 80s fans out there, you will find The Wormhole Coffee an extremely cool place to grab your morning pick-me-up. This rustic coffee shop serves locally-roasted coffee, flavorful lattes, and amazing summer tea creations. Sip on these delightful beverages while surrounded by 80s nostalgia and even a DeLorean. Once you visit Ipsento Coffee, be prepared to become a customer for life. This top-notch urban coffee house in Chicago specializes in seasonal, world-class coffees from the best sources. They also serve tasty pastries and sandwiches in a hip, cozy environment. 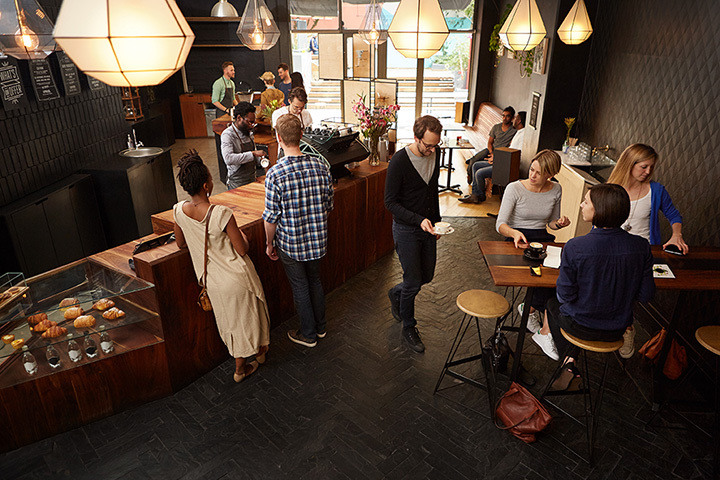 Ipsento Coffee makes visitors feel at home with their outstanding service, as well. Located in downtown Chicago, this little coffee shop serves locally-roasted coffee in a quiet indie setting. Customers rave about their delicious pastries and sandwiches, which are prepared in moments. The prices are also reasonable for a coffee shop. HERO Coffee Bar is perfect for coffee connoisseurs. This unique, non-profit café and coffee house in Chicago’s Englewood neighborhood roasts their coffee on-site and in small batches. Aside from serving delicious coffee, Kusanya Café offers tasty breakfast sandwiches, handmade pizzas, and fresh salads. Kusanya is also a community gathering place where creative ideas are born. If you appreciate coffee and artwork, Backlot Coffee is your place. This neighborhood coffee house in Evanston features locally-roasted coffee, authentic gelato, and small eats. The art-line walls make this already exceptional coffee house extra cool. The Soap Co. Coffee House is a locally-owned establishment featuring premium coffee beverages, teas, gourmet muffins, pastries, and more. This cute coffee shop also sells handmade soaps and other items from local vendors. If you want a cozy spot to relax, this is the place to visit. Want coffee on tap? Come to the Star Lounge Coffee Bar in Chicago. Customers rave about their delicious coffee beverages and pastries, which are served by extremely friendly staff. Sit at the bar without feeling guilty about drinking or sip your latte on the patio. For delicious coffee in an inviting environment, Common Grounds is a great option. Located in Carbondale, this cool coffee shop brews fresh java from organic coffee beans. It also features loose leaf teas, over 30 beverage flavors, and whole fruit smoothies. You can’t go wrong at Common Grounds. Located in Logan Square, this hipster coffee shop brews their beverages from the finest beans around the world. Gaslight Coffee Roasters also serves hearty, delicious pastries such as croissants and other incredible breakfast selections. This coffee shop gem is worth the visit if you’re in the neighborhood. If you’re looking for one of the finest coffee experiences in Illinois, Thirty-Three Coffee in Peoria is dedicated to satisfying your coffee expectations. They provide perfectly roasted and brewed coffee served by the friendliest baristas in the area. This locally-owned coffee shop takes pride in their perfected beverages, making them a cool coffee shop.